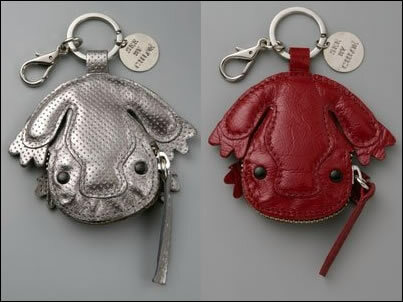 I find that most who love handbags have an affinity for keychains. It all goes hand in hand, and really, a cute key chain is a nice little touch to your car keys. Right now I have a Louis Vuitton keychain, a great Christmas gift from a friend, attached to my car keys. But I have always liked the idea of the key pouch, the key chain that allows you to stash some cash, credit card, id, and that is all you need. I have a key pouch from Bottega Veneta, yet I always forget to use it. It is simple, just as Bottega likes to be, but what if you want a little more spice and zest? 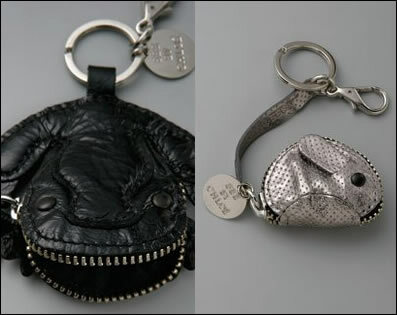 The See by Chloe Animalia Keychains are available in the mouth opening frog or the cute and petite mouse. These are the perfect superfluous accessories, the “I am not sure why I got it but isn’t it cute? !” statement pieces. I would have to try it out in person to see how much really fits in each, but this is a nice little addition to your key chain. The frog is available in red and black patent leather, along with perforated metallic anthracite. The mouse also comes in perforated metallic anthracite. Cute, not-necessary, but entirely viable accessories. Buy the patent red or black frog through Shop Bop for $160, the anthracite frog through Shop Bop for $160, and the mouse through Shop Bop for $145.